Sometimes, it takes writing a resume to find some wonderful nuggets of your own writing out in the universe. 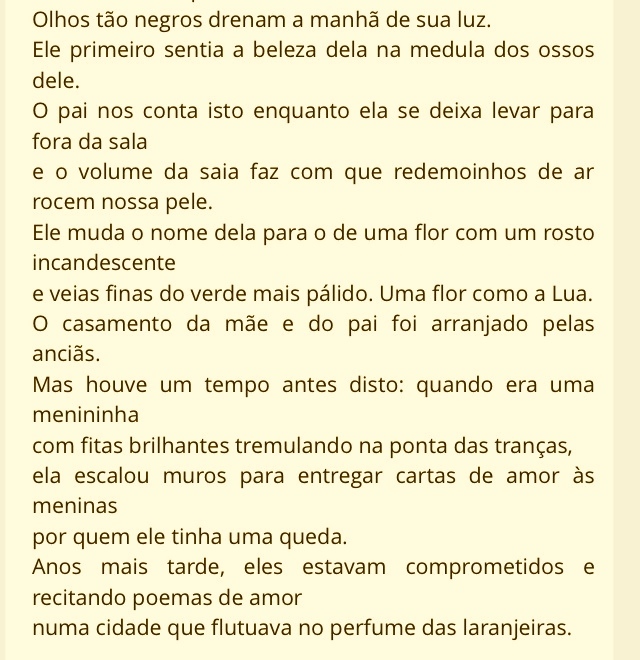 I rediscovered this Portuguese translation of my poem, originally for El Globo magazine that supplemented an article by Toni Marques, journalist and now director of an international literary festival out in Rio de Janiero. 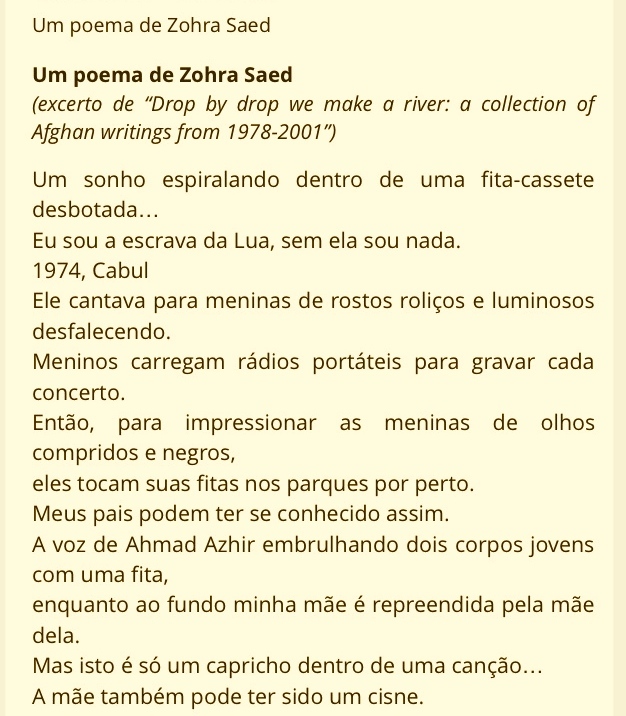 This was now on another Portuguese literary site. He sings to swooning girls with plump, luminous faces. Boys carry portable radios to record each concert. Then, to impress girls with long black eyes, they play their tapes in nearby parks. They could have met like this. Ahmad Zahir’s voice wrapping around two young bodies like a ribbon, while her mother scolds her in the background. Mother might as well have been a swan. Eyes so black she could drain the morning of its light. He first felt her beauty in the marrow of his bones. Father tells his children this as she drifts out of the room and the volume of her skirt causes swirls of air to brush against their skin. He has renamed her after a flower with an incandescent face and thin veins of palest green, a flower like the moon. Their wedding was arranged by the elder women. But there was a before to this: as a little girl with bright ribbons fluttering at the end of her braids, she had scaled walls to deliver love letters to girls he had crushes on. Years later, they were engaged and reciting love poems in a city floating on the perfume of orange blossoms. This is how father described Jalalabad. And what about their children? With spines arched, bodies closed into themselves like sleeping tulips, they are the water that parents dip their roots into. Certainly, this discovery was an inspiration to continue developing, with renewed energy, my poetry manuscript for Afghan cities.